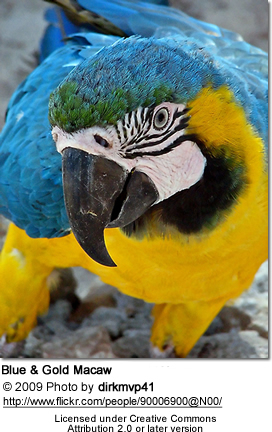 Parrots are just like having a two-year old around; with some additional concerns as far as toxicities are concerned. Their respiratory systems are far more sensitive than our own; and what we can tolerate, can kill them. Parrots are known for their constant urge to "customizing their environment" with their beaks. That is what they do in nature; build nests, chew on branches, forage for foods. Knowing that this is natural behavior for parrots, we have no reason to get mad at our parrots and/or to keep him or her locked up. This being said, leaving this unchecked and not preparing for it will result in damaged furniture or even worse. Windows: Make sure that all your windows have screens and that they are intact. Birds can escape through open windows or doors. They do like to " enlarge" holes in screens through which they will be able to escape. Therefore, check frequently to make sure that the screens are still intact. Electrical Wires: As mentioned above, electric wires should be tucked away. Parrots love to chew on them. Electricity poses a particular hazard. peppermint and spearmint helps with headaches. Teflon: Coated or nonstick pans release toxic fumes at high temperatures and can kill a bird very quickly. Normal use probably would not be harmful as the temperature must be very high to emit the fumes, but if a pan were left unattended and the coating started to burn, it could be devastating. Toxic Foods and Household Items - Ref. Green and Healthy Website. Ceiling Fans: A ceiling fan can be very dangerous to a bird in flight. You can imagine what happens when your parrot flies into a fast-moving ceiling fan. Make sure that the ceiling fan is either turned off when the birds are out, or buy a special one that has some sort of protective grid over it.